Perm (Russian: Пермь, pronounced:pʲɛrʲmʲ) is a city and administrative center of Perm Krai, Russia. It lies on the banks of the Kama River, at the foot of the Ural Mountains. Perm is one of the largest cities in Russia, with 976,116 (2006 est.) inhabitants, fewer than the 1,001,653 recorded in the 2002 Census and 1,090,944 recorded in the 1989 Census. In geology, the Permian period takes its name from the region. From 1940 until 1957, the city was named Molotov (Мо́лотов), after Vyacheslav Molotov. The city is a major administrative, industrial, scientific, and cultural center. The leading industries include machinery, defence, oil production (about 3% of Russian output), oil refining, chemical and petrochemical, timber and wood processing and the food industry. There is one international airport in Perm Bolshoye Savino (Big Savino). Perm is also served by the smaller airport "Bakharevka". Perm's public transit network includes streetcar (tram), bus, and trolleybus routes. 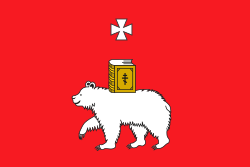 Wikimedia Commons has media related to Perm. This page was last changed on 21 September 2018, at 13:11.